Mother Nature provided us with a magnificent spectacle last Wednesday night in the form of a marvelous total eclipse of the moon accompanied by sparkling snow on the ground and clear skies up above. Tuesday night, as I watched the almost – full moon appear between the passing clouds, I was reminded of the upcoming eclipse, but I was not holding my breath because the weather forecast was for more snow and clouds. Surprise! Wednesday was sunny, but a bank of clouds hung ominously over the western horizon. How many times have I seen this happen? Sure enough, by dinner time the clouds had moved in and I pretty much wrote off any chance of seeing the eclipse. In fact, my wife and I watched a movie and I didn’t give much more thought to it. It’s a good thing the video was due back that night because when I went out to return it I was greeted by the aforementioned spectacle. In addition to the weather several factors combined to make this eclipse special. One was the position of the Moon between the planet Saturn and the star Regulus. 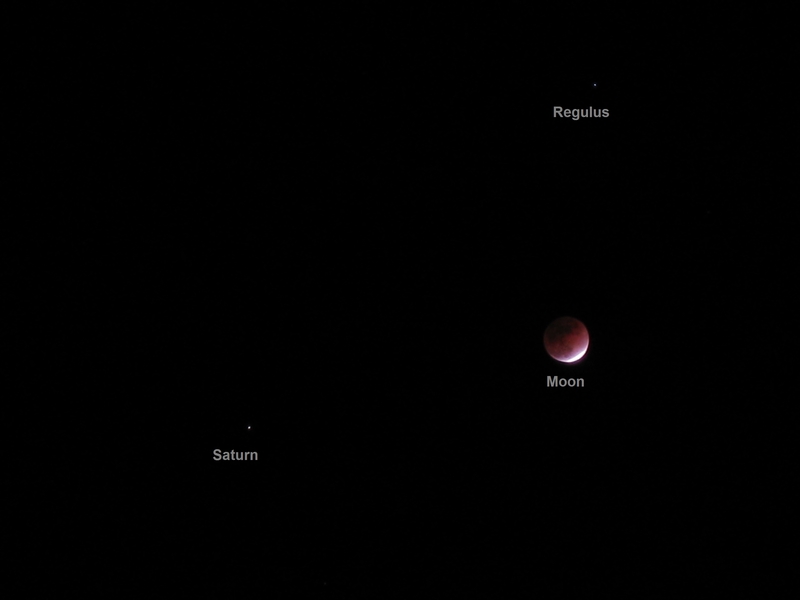 Similar in color and brightness, the two formed a lovely trio along with the golden-red moon during totality. Such a gathering would have had great significance to ancient astrologers. What made this even more interesting was the fact that the star and planet were barely visible earlier in the glare of the uneclipsed full moon. It reminded me of the total solar eclipse I witnessed in 1998 when the planet Mercury could be seen high in the sky next to the eclipsed sun. A second factor was the timing of the event. Unlike the last two eclipses visible from our area that occurred in the twilight of dawn or dusk, this one happened at 10:00 p.m., when the sky was dark. And, although I took a few very amateur photos with my little digital camera this was an astronomical event of great beauty and rarity that required no special equipment or skills to enjoy, just your eyes and your interest. Caption: Moon just leaving Earth’s shadow. Note Saturn (lower left) and Regulus (above Moon).